Groundhogs are the largest members of the squirrel family. Though they are usually seen on the ground, they can climb trees and are also capable swimmers. These rodents frequent the areas where woodlands meet open spaces, like fields, roads, or streams. Here they eat grasses and plants as well as fruits and tree bark. Groundhogs are the bane of many a gardener. They can decimate a plot while voraciously feeding during the summer and fall seasons. Many that have not seen a beaver will often mistake a groundhog for a beaver living under thier shed or deck. 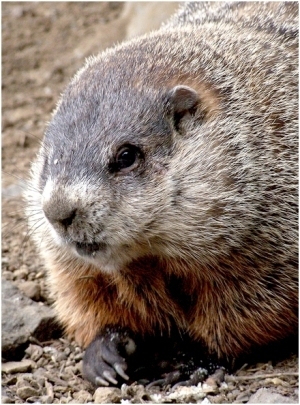 The groundhog is the largest sciurid in its geographical range, typically measuring 40 to 65 cm (16 to 26 in) long (including a 15 cm (6 in) tail) and weighing 2 to 4 kg (4 to 9 lb). In areas with fewer natural predators and large amounts of alfalfa, groundhogs can grow to 80 cm (30 in) and 14 kg (31 lb). Groundhogs are well adapted for digging, with short but powerful limbs and curved, thick claws. Unlike other sciurids, the groundhog's spine is curved, more like that of a mole, and the tail is comparably shorter as well – only about one-fourth of body length. Suited to their temperate habitat, groundhogs are covered with two coats of fur: a dense grey undercoat and a longer coat of banded guard hairs that gives the groundhog its distinctive "frosted" appearance. Groundhogs usually live from two to three years, but can live up to six years in the wild. In captivity, groundhogs can exceed this limit, Wiarton Willie lived to the ripe old age of 22 and may indicate the maximum lifespan. Common predators for groundhogs include wolves, coyotes, foxes, bobcats, bears, large hawks, owls, and dogs. 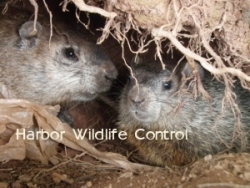 Young groundhogs are often at risk for predation by snakes, which easily enter the burrow. Mostly herbivorous, groundhogs primarily eat wild grasses and other vegetation, and berries and agricultural crops when available. Groundhogs also eat grubs, grasshoppers, insects, snails and other small animals, but are not as omnivorous as many other sciurids. Like squirrels they also have been observed sitting up eating nuts such as shagbark hickory but unlike squirrels do not bury them for future use. Groundhogs raised in captivity can be socialized relatively easily; however, their aggressive nature can pose problems. Doug Schwartz, a zookeeper and groundhog trainer at the Staten Island Zoo, has been quoted as saying "They’re known for their aggression, so you’re starting from a hard place. Their natural impulse is to kill ’em all and let God sort ’em out. You have to work to produce the sweet and cuddly."